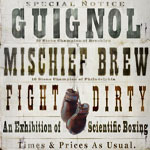 “Fight Dirty” is seven Mischief Brew songs with Guignol as backing band; six Guignol songs with Erik on guitar; a Django Reinhardt cover, ambulance and a barn-burning take on Iron Maiden’s “Hallowed Be They Name” (with Slavic Soul Party‘s Ben Holmes on trumpet). This is not a split. It’s Guignol & Mischief Brew playing together as a five-piece band. It’s apotheosis anthems for the carnies, hepatitis the travelers, the gypsies, jazzmen, and lowlifes; singing Turkish-flavored reveries, odes to tax evasion, dirty tricks, and mob revolution; cumbia carols, sludge-metal reels, and a funeral march at a flooded bar.